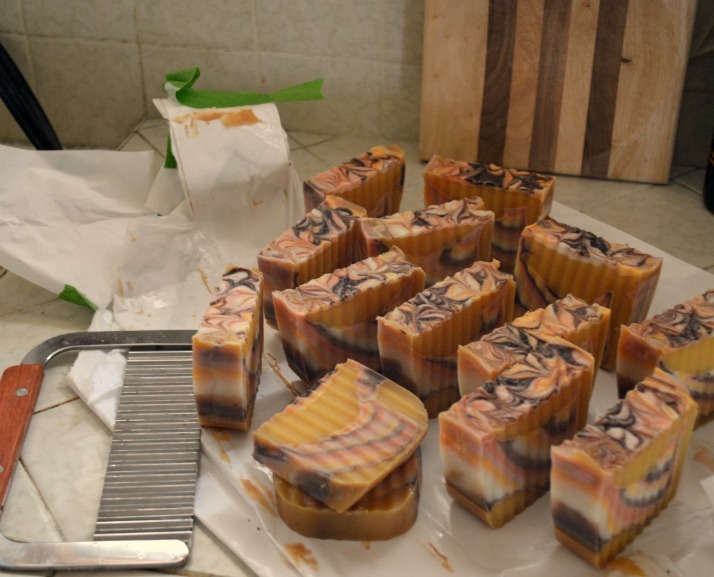 I've been so busy this last week learning everything I can about cold process soap making. Teeni from Mad Crochet Lab and Treblemaking Hookers left a really awesome comment on my last post that helped me to better understand what I'm trying to do (and how to get it to work, even if it doesn't work at first). Do you read her blog? She's got some great projects and I love the creative and fun stuff that they've always got going on over at Treblemaking Hookers! Go check them out (if you aren't already a fan!!!). I was calculating it, and I think I've made nearly 40 pounds (POUNDS!) of soap so far, which sounds like a lot (okay, it IS a lot) but it's only about 9 batches and I've learned something new with each batch. Like raw soap itches like crazy when it gets on your skin (um, lye burn?!). And cheap stick blenders aren't appropriate for soapmaking because you'll burn the motor out before your first batch has reached trace. And Costco has the best price for cheap olive oil and coconut oil, but Smart and Final will sell you 50 pound blocks of Tallow for $40. Yes, I bought 50 pounds of Tallow. LOL!!!! 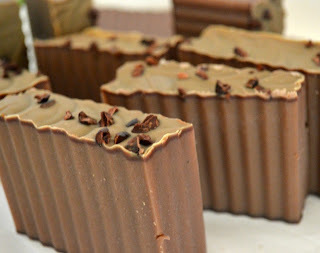 This soap is my first try using melted chocolate and heavy cream in a soap. I was going for a Chocolate Milk thing... It doesn't smell as chocolate-y as I had hoped, so next time I try it I'm going to add a chocolate fragrance oil to give it some oomph. I had some raw cacao nibs in the cupboard, so I sprinkled them on top at the end. They smell terrible right out of the bag, so I don't know what I was thinking. It makes a pretty picture, though. My previous experience with making soap was limited to melt-and-pour (MP) glycerine soaps, so the cold process (CP) way has been quite a learning curve. MP can be colored easily, but the CP soaps can chemically react with dyes in unpredictable ways. I tried coloring a batch of Pumpkin Pie soap with some soap colorants I picked up at Michaels. They weren't the deep, rich autumnal hues that I had envisioned, but the muted, softly faded colors work with the fragrance too. I tried a zebra stripe technique in this bar, and I was thrilled that it actually worked! Victory!! I think what I love about CP soapmaking is that it taps into the same skills that I needed when I was studying to be a pastry chef. I have missed the science and math and creativity that baking required, and those are all of the things that CP soap requires! And even if most people in my family have gone paleo and are avoiding sugar and grains, they're still happy to take home a soap cupcake! I do get to bust out my mad baking skills this weekend and bake some cupcake for my sister-in-law's wedding shower. 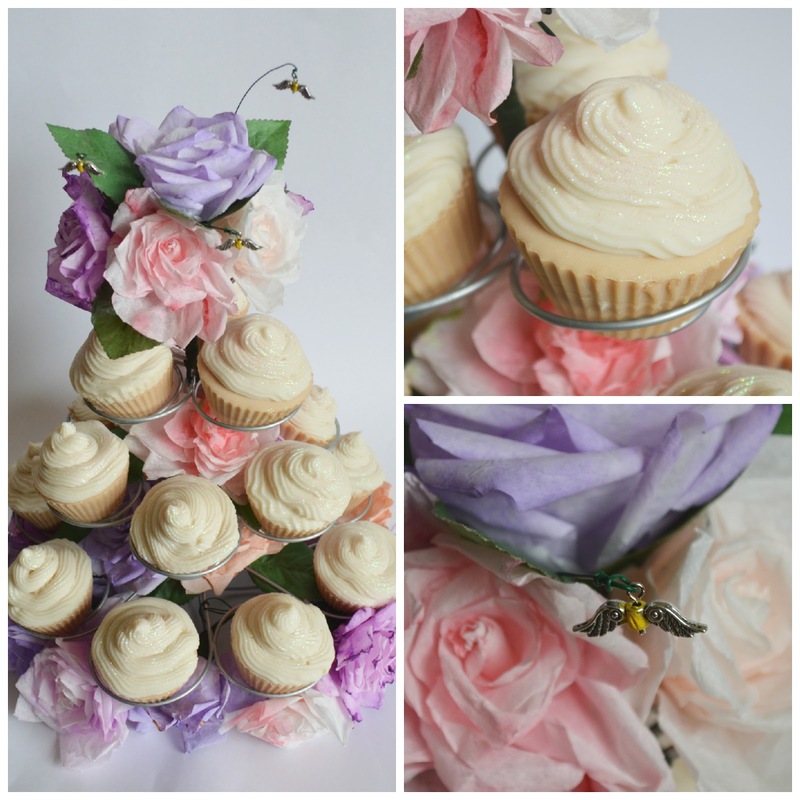 I spent nearly a month making and hand painting the roses to decorate the cupcake stands. My soap cupcakes were dry enough to handle, so I tucked them into the stands to see how they were going to look when they were full of yummy treats. I think the soap looks pretty great in the stands, so the real cupcakes are going to look even more amazing! 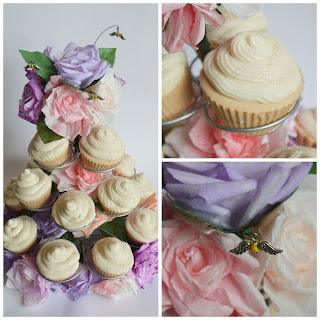 She's having a destination wedding with an unusual theme that takes its inspiration from Bill and Fleur's wedding from the first installment of Harry Potter and the Deathly Hallows. I used their colors when I colored the roses, and I couldn't help myself, I had to tuck in a few "golden snitch" bees hovering around the roses. The 'real' cupcakes will have pale lavender frosting (and will have baking cups! LOL!!! ), but I am happy with how the white soapcakes look too! It would be a cute display in a soap store. And my Mims has lost her front teeth! 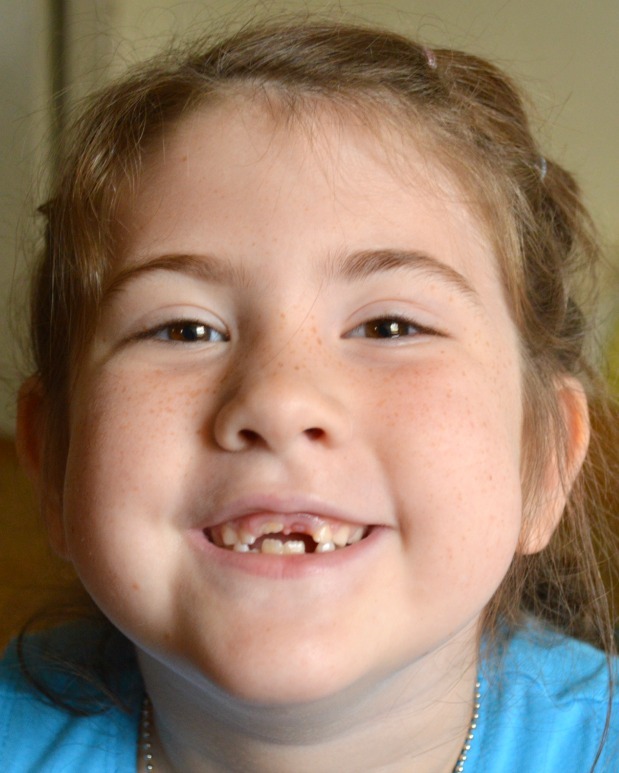 One of the big ones is already growing in, but she looks so cute and silly every time she smiles! She's going through a phase where she doesn't like to pose naturally for pictures (she likes to scrunch up her eyes and make a weird non-happy fake smile) so I'm feeling like a rockstar today because I was able to get this one. It so perfectly captures Mims as a six-year-old. I think the only problem that I've got right now is that I'd really like to crochet a soap dish for my pretty new soaps. I've got a few ideas that I'm noodling around, but they need to keep the soap from getting soggy, and most crochet yarns absorb water, or (like plarn) won't wick it away. I'm thinking of nylon cord... But first, I've got to get through this shower weekend! My mom-in-law will be staying with us for a few days, so I don't know how much free time I'm going to have. I really liked reading "Keeping Busy". Your soaps look so yummy-almost want a taste. Thanks for sharing such wonderful pictures! 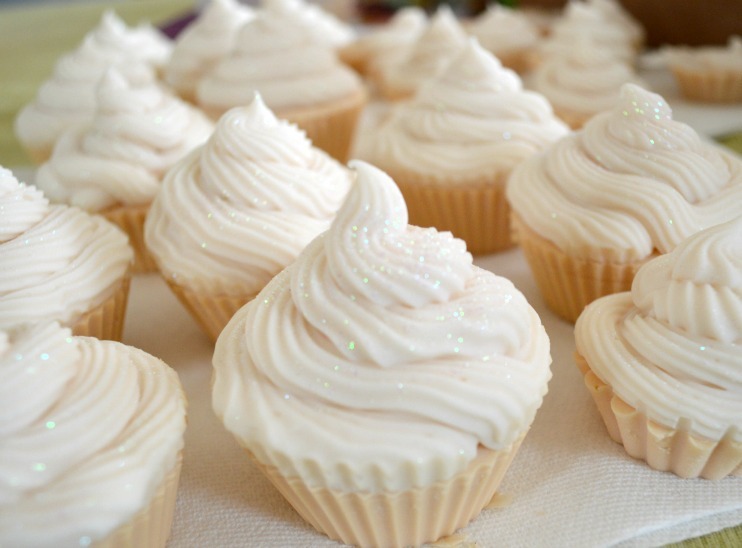 The soap cupcakes are beautiful! Maybe twine would work for the soap dish? I love your soap cupcakes! Hi There,Wow!! !Looks like you're having a lot of fun!! !The soaps look yummy enough to eat!!! !Nice job with the roses!! !They look fantastic!!! !Have a great weekend!!! Your soaps are amazingly fancy and beautiful (and yummy-looking!). I don't suppose you want my glycerine block and plain-pour soap molds -- you're so far beyond that stuff! Good luck with the shower this weekend, and the MIL visit! Those are GREAT photos, I can't believe those are soap cupcakes! Beautiful work, what a great table arrangement.